Rachmaninoff's Etude-Tableaux are meant to create a picturesque scene in the minds of the listener. If you recall my earlier blog post about the e-flat minor Etude-Tableau, I discussed my scenario of a man at the mercy of nature at its fiercest. In his g minor etude Op. 33 No. 5, I've become so entrenched in the analytical side of this piece that it's difficult for me to let go and be in the music, well, extra-musically. So I leave it to you the listener, what do you see? Is that a storm in the middle of the piece? If so, did it end well for those that experienced it? Or was that another cry of defeat or desperation in measures 33-35? Compositionally, especially from the perspective of motivic efficiency, this work is on par with that of Beethoven. Rachmaninoff obsesses over a five-note motif which weaves throughout the entire work. There really isn't a secondary theme which is based on a different motif, this motif controls the development of the piece as it moves from the lyrical opening to the spiraling climax. After this dramatic climax we return to the opening lyrical section for a brief moment only to spiral into the final climactic scale which ends the etude. The structure of the work is roughly A, B, A', coda. What's particularly unique about the structure of this etude, and a few others in this collection of etude-tableaux, is that the tonality is never really established in any other key aside from the tonic of g minor. Though modulations occur for brief excursions to leave g minor behind, diatonically, no other key is really established cadentially. In fact, a harmonic analysis of the climax of the B section will leave you futilely scratching your head. At first it's spiraling patterns seem to lead to some sequence, but it soon becomes highly chromatic and unpredictable only to end up at c-sharp minor at measure 30, which doesn't function in any traditional sense but chromatically arrives back to g minor within a few bars to bring the piece to the A' section. Let's take a look at Rachmaninoff's obsessive use of this five-note motif and its development throughout the work. 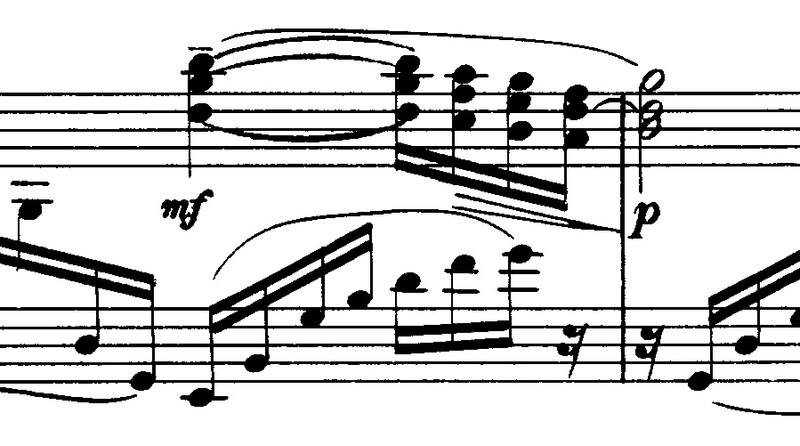 See Ex.1 below which shows the first occurrence of the motif as it swims between the hands of the pianist. By measure 11 we become fully immersed in the dense musical layering that is quintessential Rachmaninoff. See Ex. 3 below. 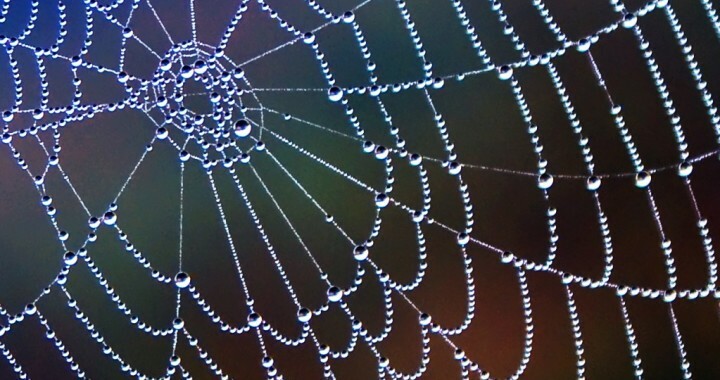 Notice how the motif is spun like a web in which layers begin and end with the motif— a spidery moment. Well, it certainly is strange how an analysis of the music can bring me to my own "tableau". Perhaps this is the spinning funnel web of a predatory spider? For whatever creature got stuck in this web, it didn't end well— escape seems impossible. Let's take a look at Ex. 4, the climax of the piece. Rachmaninoff still spins this motif, now inverted and becoming reckless. This is where a our spiral now becomes a death spiral! 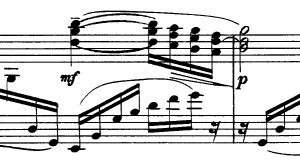 At the end of this climax, see Ex 5, as we move back to the A' section, this motif is now shown as a chromatic line which is emotionally full of desperation. It is marked forte to pianissimo. Perhaps this is our creature's cry for help? As Rachmaninoff concludes the piece, he quotes Chopin's great Ballade, Op. 23, which is in the same key of g minor. Compare ex. 6 (etude-tableau) and 7 (Chopin's Ballade in g minor). This scale is like a tragic grip of death. Even the most cool and collected pianist cannot help but tremble and become anxious with its terror. I'm very proud to have one of my students, Ann Arney, record this from her home on her Steinway M. Enjoy!